The trauma of Ireland’s troubles is played out between two siblings in David Ireland’s emotionally intense drama. David Ireland’s Everything Between Us premiered in 2010 and, seven years later, has finally has made its way to the English stage. In the wake of the recent collapse of power-sharing talks at the Stormont, its exploration of Northern Ireland’s politics feels more timely than ever. Set on the first day of the Truth and Reconciliation Commission for Northern Ireland, the play gives us 70-odd claustrophobic minutes with Sandra – about to take her seat on the Commission – and Teeni, her younger, long-lost sister. As the play progresses, we quickly learn that Teeni has been away from Ireland for 11 years and it is today of all days she decides to make an appearance, arriving at the Stormont because she knew Sandra would be there. What follows is an exchange that crackles with energy, leaning more heavily on emotion than the historical context one would expect from a play set in the wake of the Troubles. Ireland’s writing is often electric. The script excels at pushing what should be a tired narrative device beyond its usual limits; we have two people locked in a room together, who both threaten and/or attempt to leave but always manage not to (at least until an appropriate amount of time has passed). Cleverly moulded as an office space but with the bare minimum on set to distract an audience only a couple of feet away, the Finsborough Theatre’s upstairs box of a stage is also a perfect location. Less perfect, however, is the opening premise of the play. In its first minutes, Teeni is dragged into the side room (and subsequently on stage) by Sandra, having apparently shouted racial slurs and punched someone in the head in the middle of Parliament. This ‘someone’ turns out to be a South African ANC member who has come to Ireland to help advise the Commission, and Sandra rightly worries that the police will assume Teeni is a terrorist. However the consequent revelation that Sandra has managed to gloss this over and protect her sister from security and the authorities ‘as long as she doesn’t leave this room again’ is beyond far-fetched at best. Even more irritating are Teeni’s racist motivations, or perhaps, her lack of. We never really learn why exactly the younger sister chose to attack “that black woman”, and her excessive use and defense of racial slurs feels like an overused theatrical cheap shot. It’s almost too easy to frame Teeni as the villain so early on by letting her unflinchingly shout the N-word a dozen times, and feels hollow in comparison to her far more nuanced way of spitting racist hatred for ‘Fenians’ later in the play. Regardless, the play’s biggest strength is easily the performances of the two central characters. Katrina McKeever’s aggressive and temperamental Teeni has a child-like quality, but with an adult edge that only serves to make her seem all the more dangerous. We believe her when she insists she doesn’t drink ‘any more’ but we also believe that her demons persist, and her account of her last night drinking is painful, sad, and deeply pathetic. While Lynsey-Anne Moffat’s Sandra’s real moment to shine doesn’t come until the second half of the play, her vulnerability, empathy, quiet fury and resignation really bring the closing moments together. Similarly, the bounce of the two sisters’ back-and-forth moments serve to add humour to the piece, but perhaps the funniest instances are those that have a hard or depressing edge. Highlights include Teeni’s account of her exchange with an Irish Catholic in a New York bar who compares himself to persecuted people throughout history (“I was like, hold on here – you can’t be the Jews and the Palestinians”), and Sandra’s reason for leaving the church after the arrival of a priest “with his 1970s Jimmy Osmond haircut”. While as audience might find itself focusing more on the ‘everything between’ Teeni and Sandra as opposed to the wider issues of a post-Good Friday Agreement Northern Ireland, the weight of the politics around them eventually becomes too heavy to ignore – particularly in the play’s final moments. The trauma of Ireland’s troubles is played out between two siblings, and as Sandra speaks of some of the people the Commission will be listening to, it’s easy to imagine how many other families suffered on both sides. Despite all this the sisters’ meandering conversation asks more than it answers, with many questions left unresolved. It seems as though that’s the point. Truth and reconciliation is often messy and unsatisfactory, with some bodies refusing to be buried. Perhaps this is what the play does so well; the first step in moving forward is to give the Teenis and Sandras of the world a chance to speak. 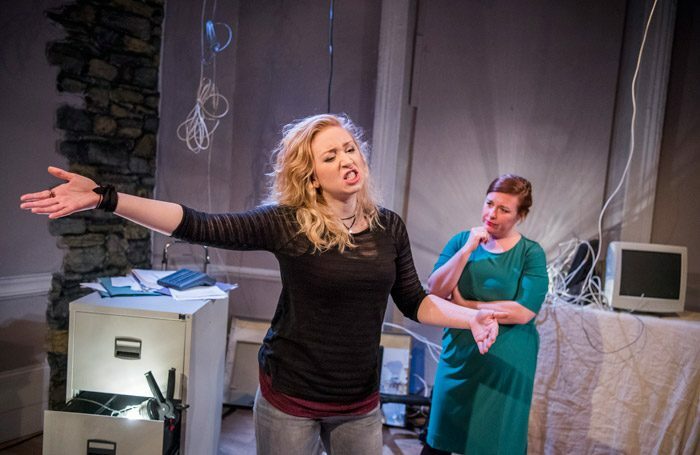 Everything Between Us is on at the Finborough Theatre until 16th May. Book tickets here.